A sad day today. My musical hero, who accompanied me through my whole life, died yesterday. David Bowie was a genius and words cannot express how very, very sad I feel. So this week, I'd like you to be inspired by YOUR musical hero. 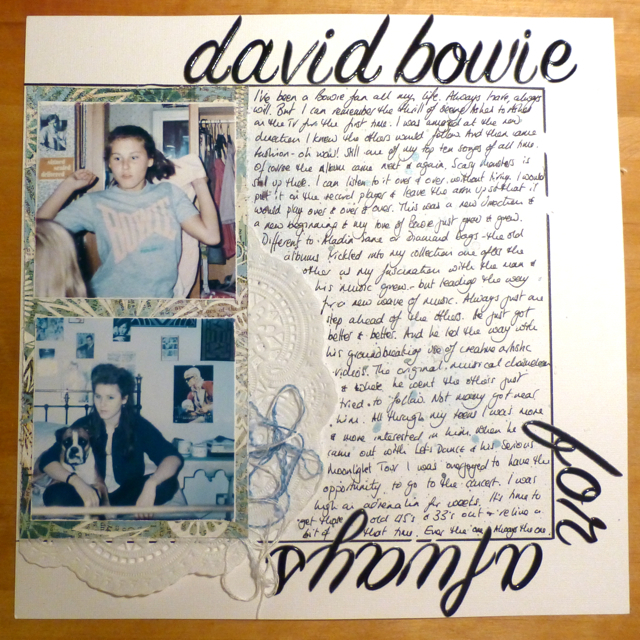 I've made a Bowie page before using the album inspired prompt WM#65 but I feel another page coming on. And I need to find that t-shirt - there's a page there too. We love it when you share so don't forget to upload your wonderful creations to our Whimsical Musings Flickr gallery with the tag WM#196. I'll put a name out of the hat for the winner of my little giveaway later in the week. And I want to remind you that there is something special coming up next month to celebrate our 200th prompt - you are going to want to hang out with us and play along - there might be more giveaways available! I am thinking that I may combine this with a Feb. CKC challenge prompt, that will seem very unlikely but fits. I don't have a someone but a genre that has threaded thru my whole life & has special ties to my beloved Aunie.